Virtual reality recreation of the Victoria Theatre. Dr Arrighi has been researching the extent of live performance in the greater Hunter region from 1845 and the UON Innovation Team have taken her research and made in into an immersive virtual reality experience allowing the public to see inside the historical theatre. The extraordinary and stunning virtual recreation transports users into the late 19th century Victoria Theatre. Participants can meander through the foyers and three levels of stalls, circle and gallery before viewing the stage as it was nearly 130 years ago. Dr Arrighi said the Victoria is the oldest theatre building in New South Wales but until now we didn’t know how the auditorium and stage looked or just how beautiful the interiors were when the theatre first opened. 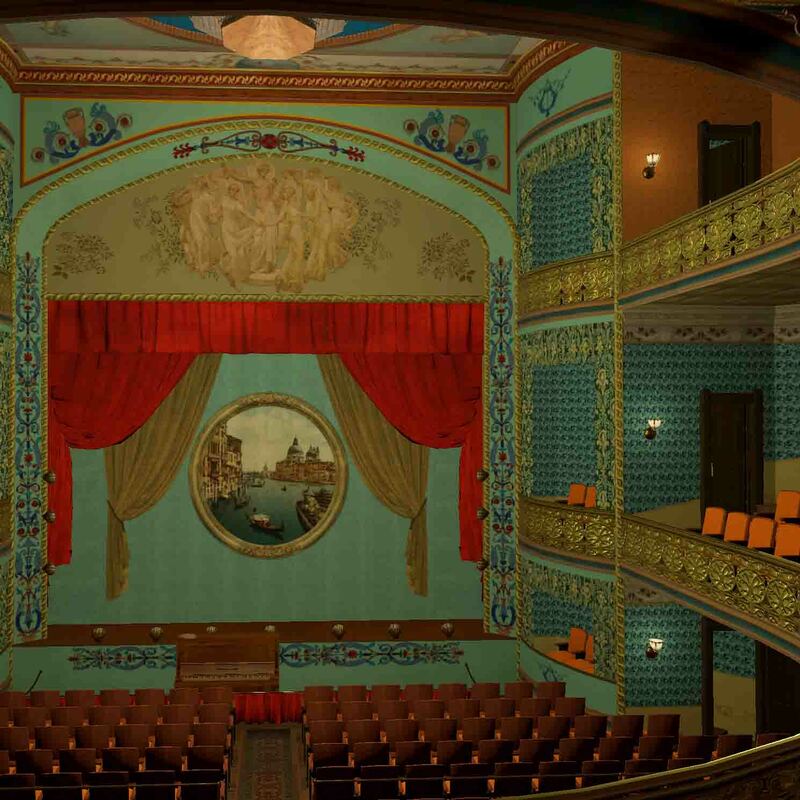 “We know the best architects and interior designers of the day worked on it and now this virtual reality reconstruction allows us to experience spatial and visual immersion in the theatre in a gamified creative approach. It is enabling us to understand why this important cultural landmark attracted the best international and national artists of the day to Newcastle, and how it was used both by performers and by the public of Newcastle,” Dr Arrighi said. The project to ‘Visualise the Victoria Theatre’ is part of the national AusStage Phase 6, funded by the Australian Research Council through the Linkage Infrastructure Equipment and Facilities scheme. Dr Arrighi said that understanding the ways that live performance contributed to the social development of our region has underpinned this long-running research project. “The opening of the Victoria Theatre in 1891 has been a natural target for the project, although it’s been a ‘slow-burn’ to finally get to this point where we can begin to understand how the building of the Victoria in 1891 changed the scope of entertainments available to the people of Newcastle. It attracted major international and national touring artists and producers, and provided the community as well with a beautiful theatre in which to perform their own locally produced theatrical events,” she said. The Victoria Theatre has undergone numerous renovations and makeovers that removed most traces of the original and there are no photos of the original interiors, so it took some historic detective research to recreate what the theatre might have looked like. “To decipher what the interior used to look like we used highly detailed eye witness accounts, trade catalogues from the 1890s, visual and architectural references derived from other theatres of the era that have a photographic record; as well as colour and design information gleaned from contemporaneous interiors by the firm contracted to decorate the Victoria Theatre. The Melbourne-based firm of Patterson Bros. did the interiors for Melbourne’s Villa Alba (1882-84) and we have turned to the colours and designs of the Villa Alba interiors to propose how some of the interior design elements of the Victoria may have looked,” Dr Arrighi said. “Researchers from theatre, natural history illustration, music, cultural history, and virtual reality have worked together on this project—it’s been a truly collaborative journey of discovery,” she said. Owners and custodians of the Victoria, the Century group, assisted with the University on the project, and will host the official launch of the virtual reality experience on site at the theatre on Tuesday 13th November 2018, 6-8pm. The night will consist of an official launch and the opportunity for invitees to experience the virtual reality first hand and talk with members of the project team.